Welcome to our beach escape at the beautiful Gulf Shores Plantation Resort in Fort Morgan, Alabama. The Plantation is a gated, family-oriented vacation destination offering over 2000 feet of private, wide, sugar-white sand beach on the Gulf of Mexico, with natural dunes and gorgeous landscaping. In addition, our resort is adjacent to over 1 mile of totally undeveloped beach. Ideally located, Gulf Shores Plantation is 15-20 minutes away from the restaurants, shopping, and entertainment of Gulf Shores, yet our beach is not crowded or over-developed. A perfect place for an active family vacation or romantic getaway. You can park right outside the front door of our privately owned, 1st floor studio condo, which is decorated with original artwork, and has a queen sleeping area with an additional sleeper sofa. There's a fully equipped full-size kitchen and a separate bathroom. Rent directly from us via this listing and you will be saving 20% over rates you would pay renting from the vacation rental management company for Gulf Shores Plantation. The Plantation offers an incredible amount of on-site activities/amenities. We promise you'll have a wonderful vacation at an unbeatable value in our home-away-from-home. Wireless internet (WIFI) is available in the unit. On-site: 7 pools! (6 outdoor, 1 indoor heated), kiddie pool, 2 outdoor hot tubs, 3 indoor hot tubs, 3 saunas, steam room, sand volleyball court, 8 tennis courts (7 lighted), lighted basketball court, 2 lighted shuffleboard courts, lighted horseshoe pits, 2 fitness centers, putting green, seasonal beach service, charcoal grills, laundry facilities, lending library, ATM, Kiva Dunes Golf Course (next door). My husband, 6 year old daughter, and I just wrapped up spring break at The Plantation. We were delighted with the place. We had never vacationed in the Gulf Shores area and were a little unsure of what to expect, usually we vacation a little farther south. However, we were thrilled with this place. It is definitely out of the hustle and bustle of town which was great but not that far away that running into town for dinner or a day at the zoo was no big deal. The 5 outdoor pools, and the 2 indoor pools gave our daughter plenty of places to swim. The indoor pools were nice when it was a little chilly on a couple of days or on into the evening. The boardwalks down to the beach are easy to access from all over the property and made getting to the beach very easy. We ate at Sassy Bass and found it tasty. As for the condo itself it has everything you could ask for in a studio apartment. We found it fine for the 3 of us, with the exception that there isn't a lot of room to put your empty suitcase. The kitchen has plenty of dishes and all of the small appliances you could ask for. We definitely enjoyed our stay and are already thinking about next spring break! The accommodations were cozy and quiet. No crowds, no traffic— it was awesome. This is the 2nd year in a row we stayed at this condo! The owners are great about providing information about the condo. The condo was clean and in my opinion the best location on Gulf Shores! We look forward to staying again next year! The property was nicely kept. Staff was nice. Great vacation spot. Loved it! We felt a little misled. The owner was very nice, but the condo was not as close to the beach as we thought it was going to be. We felt slightly misled about how close the beach would be to our condo. The indoor pool and hot tub was nice but quite a walk from our condo as well. And the outdoor hot tub was a little far from the outdoor pool. If you have small kids you need to keep a close eye on you can not watch them swim and enjoy yourself in the hot tub at the same time. Also the condo was stocked with dishes but no cleaning supplies at all. We had to go buy a broom just to be able to sweep the sand up off the floor. There was sand everywhere when we got there like no one had cleaned it up from the previous tenants. We're sorry you thought the condo would be closer to the beach. A courtyard with 2 pools and a hot tub is between our building and the boardwalk over the sand dunes to the beach. We offer our renters the most extensive variety of indoor and outdoor amenities in the area, so some of them are farther from our condo than others. Had we known there was sand in the unit when you arrived, we certainly would have notified our cleaning service care of it. We have notified them to make sure any sand is cleaned up in the future. Very well kept property just steps from the beach! 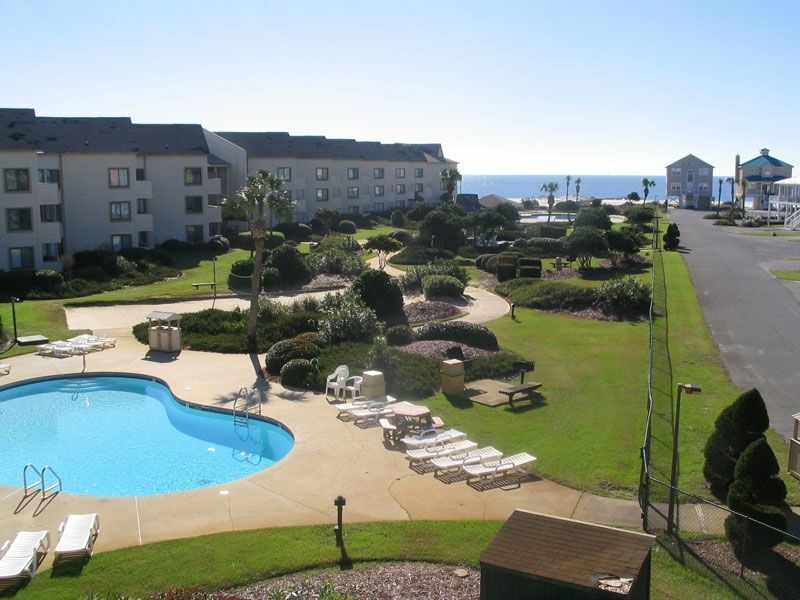 Condo is at the Gulf Shores Plantation Resort, on the Fort Morgan peninsula. About 14 miles west of Gulf Shores and 8 miles east of Fort Morgan. 2019 rates. $200 refundable deposit required. $70 cleaning fee. 6% tax. $20 Resort Fee for each car (paid to the condo association separately prior to check-in). Winter: 4th & 7th night free, 2 night minimum stay. Spring: 7th night free, 2 night minimum stay. Spring Value: 7th night free, 2 night minimum stay. Summer Value: 7th night free, 3 night minimum stay. Summer: 7th night free, 3 night minimum stay. Fall: 7th night free, 2 night minimum stay. Fall Value: 7th night free, 2 night minimum stay. $200.00 refundable reservation/damage deposit required at booking. All other fees are due 14 days before check-in, 30 days before check-in for monthly rentals. Electronic (online) payment including credit cards is accepted via HomeAway Payments. Maximum occupancy is 4 people, regardless of age.